to our global climate crisis. to ensure a brighter future for us all. 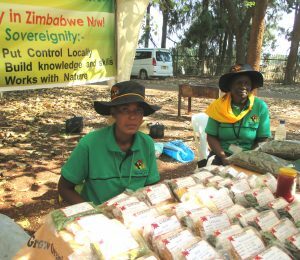 Members of the Zimbabwe Smallholder Organic Farmers Forum display their seeds at a seed fair. Seed fairs bring together a range of sellers from whom local farmers may purchase indigenous seeds, rather than from vendors tied to corporate agriculture, a major contributor to climate change. History shows that grassroots organizing has been a vital lever of major social change — from decolonization to civil rights to the environmentalism movements. Moreover, grassroots solutions from agroecology to natural resource protection are not only curbing emissions, but also building the power of climate-impacted communities. Yet today, grassroots efforts often remain underfunded and overlooked. This missed opportunity is tremendous. Grassroots communities in Africa, Asia, the Arctic, and the Americas are already implementing programs that promote people’s access to and participation in the care of their water, soil, air, seeds, forests, livestock, and land. These solutions are addressing the root causes of climate change, including loss of territory and resource rights, as well as the expansion of industrial agricultural systems, mega-dams, and fossil fuel extraction. 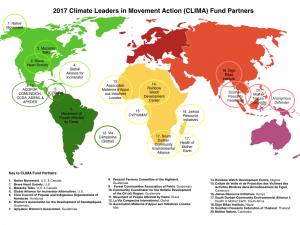 The CLIMA (Climate Leaders In Movement Action) Fund, formerly named the Grassroots Climate Solutions Fund, is a pathway for funders to directly support Indigenous, women, and youth-led work building climate resilience and mitigating climate chaos. powerful enough to address the greatest challenge of our age: climate change. Who we are: Thousand Currents, Global Greengrants Fund, Grassroots International, and Urgent Action Fund for Women’s Human Rights launched a unique collaborative fund in 2016. The fund helps large funders to directly reach grassroots organizations and social movements that are working at the intersection of climate resilience and human rights. This global reach is possible thanks to the long-term relationships each of the Fund members have developed with grassroots groups around the world..
Click here or the image above for a 2-page summary of the CLIMA Fund (formerly the Grassroots Climate Solution Fund). What we will achieve: The CLIMA (Climate Leaders In Movement Action) Fund provides an unprecedented continuum of support to people fighting climate change — from awarding a security grant in as little as 12 hours to an activist whose life or family has been threatened, to providing a promising grassroots movement with its first infusion of outside resources, to sustaining established organizations with multiyear support and capacity-building through proven long-term partnership models. We will help support a global movement of grassroots actors that are the protagonists of immediate, ambitious, and just solutions to the climate crisis. How we work: For three decades, our four organizations’ grantmaking practices have relied on the wisdom and strength of local people and movements to tackle injustices. We invest in long-term solutions that are not imported, but rather developed in response to listening to people on the ground. These grassroots solutions can be scaled appropriately to meet the needs of people who are most directly affected by climate change, while reducing emissions at their source. 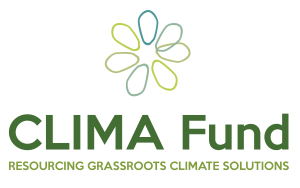 The CLIMA Fund will transform large amounts of grant capital into strategic investments for effective grassroots climate solutions being led by our partners in more than 100 countries. We are seeking funding partners for this multimillion dollar venture. Join the David and Lucile Packard Foundation, Libra Foundation, Swift Foundation, Whitman Institute, the Weissman Family Foundation, and individual donors in providing unprecedented and urgent support for climate movements globally. Questions? Contact Lindley Mease, Coordinator of the CLIMA Fund, at lindley (at) climatesolutions.org. As is the case with many systemic, pressing challenges, no one has all the answers. The CLIMA Fund is creating a space for transparent, deeper discussion about the underlying narrative frames and assumptions around who climate protagonists are and what constitutes a ‘climate solution.’ Participants walk away with new understanding of the hypotheses that fellow funders hold about addressing the climate crisis and new ideas about how we are supporting climate solution practitioners as a community. Novel and creative ideas are needed to tackle the greatest challenge that has faced humanity – climate change. Yet there is significant disagreement about what constitutes innovation, and where that innovation is coming from. In this online conversation, we unpacked how funders understand innovation and what that means for those who receive funding. Innovation is about change, failure, breaking boundaries, and collaboration (and more). Sometimes it’s about new ideas and often it’s about connecting very old ideas. There were critiques raised about philanthropy often seeing themselves as the innovators and rewarding ideas and actors far from the problem itself. And there was an invitation to re-imagine our roles as those not crafting or identifying innovation, but being in solidarity with it. How do we invite failure and risk-taking by transferring the risk to ourselves as funders? Innovation is also about perception—a new grant-making practice can be innovative to one funder and not another. In the context of climate change, where the innovators are ultimately those on the ground, how do funders listen more and get out of the way of communities doing the work? And finally, in terms of innovating grant-making practices, ideas were surfaced about providing long-term unrestricted support, pooling resources to give bigger grants, and supporting learning exchanges among those taking action on climate. Scale – what it looks like, when and how to achieve it and when and how not to, and funders’ role in supporting scale – is tricky. How can we be driven by the urgency of climate change, while slowing down enough to listen and make choices that will effectively reduce emissions and sustain all life? In this online conversation, we will unpack how funders approach scale in their work and how that impacts who and what is funded. Speakers expressed many different definitions of scale, including scale as power-building, as systems change, as pace of change, as exponential growth and replicability, and as dependent on the efficacy of a strategy. Speakers challenged many of the common assumptions around scale in philanthropy, such as scale correlating to size of nonprofits, number of acres conserved, and as measurable growth. Speakers agreed that emissions are part of the climate puzzle, but not everyone agreed that focusing on emissions is the only way to solve it, believing that transforming power inequities is central to addressing climate change. There were different opinions about the importance of metrics in assessing scaled impact, and about the role of accountability (e.g., accountable to climate outcomes vs./and accountable to the communities most impacted & taking action). There was a lot of conversation about movements as a strategy for scale, and for addressing the drivers of the climate crisis. There were assumptions surfaced about equating scale to rapid change, and how that assumption sometimes compromises consideration of human rights and equity. Finally, there was a challenge to funders to think deeply about our role in driving the same systems we seek to transform, as a critical undermining of scaled action on climate. How might we bridge the gap and translate, if not reimagine, how we communicate the impact of diverse climate solutions? Whether or not you are tracking greenhouse gas emissions, collecting and assessing metrics is challenging. In this session we will discuss what might be important to evaluate, what’s not, and how we can evolve evaluation practices to support rather than hinder climate solutionaries. Participants felt a mixture of curiosity, frustration, and fear when reflecting on evaluation and metrics. Participants have different understandings of how evaluation is done, from direct observation to self-reflection to story-based assessment. Evaluation is viewed as a process for learning, for measuring impact, and/or for building power. Supporting movements presents a specific set of evaluation challenges, such as the complexity of attribution, the length of time it may take to see outcomes, and setbacks are inherently part of the work. When we talk about evaluation we are talking about values. Funders and grantees may value different things, and that is okay. However, funders can be sensitive to how their understanding of impact may be limited by their own experience. In the context of climate change, evaluation of greenhouse gas emissions reductions and the advancement of equity are sometimes in tension. When supporting climate justice, funders must consider how to shift power in evaluation itself, and consider who is paying the cost of the climate action funders are supporting. Evaluation takes time, attention, and capacity, and funders must ensure they listen to their grantees about what’s valuable to track. Evaluation brings up some sticky questions about power: Who decides what gets measured and when? How is information shared & given to grantees? What is capacity and why (or why not) is it important to climate action? In this session we will explore how funders assess and understand efficiency in grantmaking and on-the-ground work, and what some of our assumptions are about grantee partner capacity. In the context of climate, what constitutes efficient and resourced work? How might we approach climate change with funding strategies that reflect the complexity and interdependence of the crisis itself? How might we bridge domestic and international funding initiatives to support linkages within the global climate movement? In this session we will unpack assumptions about geography, how different funders make choices about geographic funding, and what that means for advancing transformative climate action.